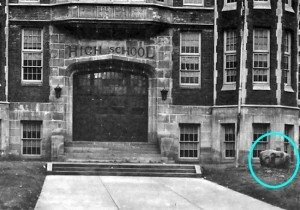 On the right side of this picture taken in 1937 of the front entrance to the old Wooster High School (now Cornerstone Elementary School) is the large rock the school board accepted as a gift from the class of 1917. 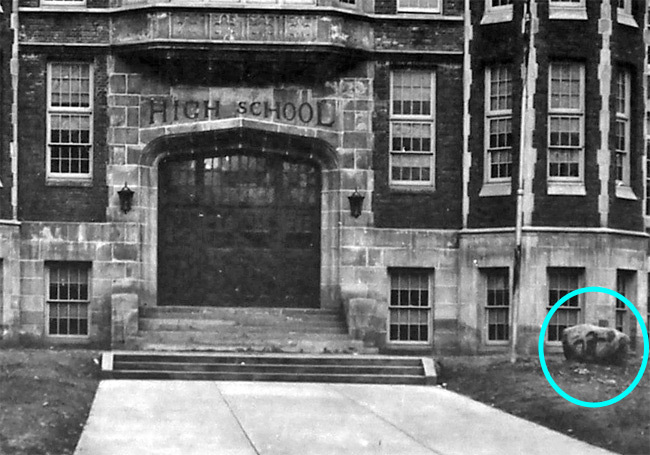 Did you ever notice the large rock that used to sit on the front lawn of the old Wooster High School? Ever wonder how it got there? Or what happened to it when the new Wooster High School was built and opened in 1994? Fear naught the old stone was moved along with everything else that was a part of Wooster High School. It has been painted “Generals’ Blue” and prominently rests on the high school campus built along Oldman and Oak Hill roads on the left side of the large flagpoles. When I was in high school i never really noticed the rock as i always entered and left the school from the back entrance as i lived northwest of the school. I vaguely remember some people associated with high school sports getting upset that members of a certain school rival had stealthily sneaked onto the grounds and painted the stone red and black one year before a big game between the two schools. I always thought it was just some stone they dug out of the ground during one of the various construction periods for the old school. However, i recently learned that stone was a white elephant gift from the class of 1917. A series of newspaper reports published between May 28, 1917 and June 8, 1917 by the Wooster Daily News provided the full, and humorous, history of the hallowed 1917 Wooster High School rock. Image courtesy of the Wayne County Public Library Genealogy & History Department. Special thanks to Dan Ackerman and Wooster City Schools Buildings and Grounds Manager, Mike Foore, for finding the current location of the 1917 rock. The events that led to the appearance of the rock on school grounds started on May 25, 1917 when the traditional Junior-Senior scrumptious banquet was replaced as a war economy measure (the U.S. entered WWI on April 6, 1917) with a simple reception held at Kauke Hall. Upon hearing that the Junior class was not going to offer the Senior class anything to eat at this reception, a number of the Senior class boys immediately organized a weiner roast on the same night. Apparently, the hot dog party was the bigger class draw, as only nine “patriotic” Senior class boys attended the Junior-Senior reception and school authorities were surprised at the absence of so many of the boys of the Senior class at the reception. Following the unsanctioned weiner roast, the group full of vim and vigor from good “eats,” found a huge rock and rolled it onto the school lawn and carved their class numbers “1917” into the stone. Police officers were called to the high school at 2 o’clock Saturday morning to quell a class scrap in which juniors and seniors had participated. Two men employed by the juniors were placed in the city prison for a few hours. No fines were paid. The seniors had spent the early part of the evening guests of Supt. and Mrs. Maurer. They learned that the juniors were planning to make some changes in the lettering on the stone at the high school. The senior numerals “1917” had been carved into the stone. The juniors planned to make an “8” out of the “7” so that the stone would represent their class. Senior boys, wearing their commencement suits stood guard about the stone. The junior bunch showed up about 2 a.m. and had two stone-cutters with them. A lively scrap ensued and then the police were called. The figures “1917” are still on the stone. Although guarded all night long by seniors and sophmores, the Juniors at the high school, bright and early Thursday, when the big stone near the building was unguarded, brought a mason who hastily changed the figure “7” into a handsome “8” making the figures read “1918” in place of the former “1917”. The change was made after the last guard went off, it was stated, up in the early hours of the morning a few well directed strokes made by the mason and teh 7 was an 8. During the day the seniors filled up portions of the figure “8” with mud until the stone announced the glaring number “1917” again, and it was stated a local mason, during the afternoon would cut the 8 off the face of the stone and obliterate it henceforth and forever. “Unless the warfare over the large stone out by the high school building is discontinued, we are going to cart it out and drop it in a hole some place,” said Supt. G.C. Maurer, when asked Friday what was going to be the finish of the high school fight between classes of 1917 and 1918. Thursday morning the 1917 was changed to 1918. In the afternoon a stone mason put it back to 1917 again. Friday morning it was changed to 1918 once more. Some classmen contended that as school was out the war was over, and the last change during the school year was the one that must stay good, but the contention has become so strong that traditions are being cast aside. “I would like to come back next year, for this junior bunch is a live crowd,” said Dr. C.G. Heckert, Wittenberg college president, during his commencement address at the opera house Thursday night. Dr. Heckert had been interrupted several times by the juniors who repeatedly interfered with the program by flaunting their colors in front of the graduating seniors. The first act of war was to release three sparrows with junior colors tied to them. They flew around for a time and then disappeared. Next a paper sack was thrown out from one of the wings of the stage and landed near the center of the front of the stage. Three mice, also decorated with colors, made their exit and played around the footlights for a time. The third overt act was to let two balloons escape from the orchestra pit door. They soared gracefully domeward and lodged there. No bombs were dropped. “Well, it’s Rhode Island Red,” he exclaimed. 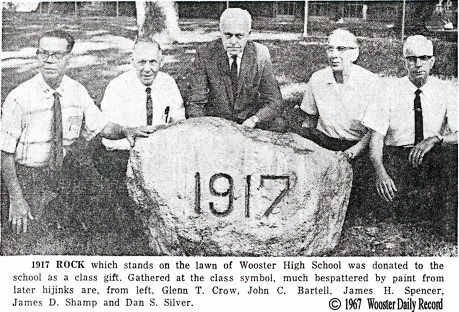 Less than a week after the astounding display at the 1917 Commencement exercises, the Wooster Board of Education held a meeting and announced that a motion had been made to formally accept the stone as a gift. A vote was taken and the rock officially became school property. Furthermore, the Board ordered that the numbers “1917” were to be inscribed on the stone and said that prosecutions would follow any other changes to the rock as perpetrators would now be guilty of defacing school property. The Board said they would prosecute any vandalism to the rock to the full extent of the law. Thus ended the rivalry between the Wooster High School classes of 1917 and 1918. The class gift still stands on the campus of Wooster High School a silent symbol of rivalry and teenage pranks of the past.